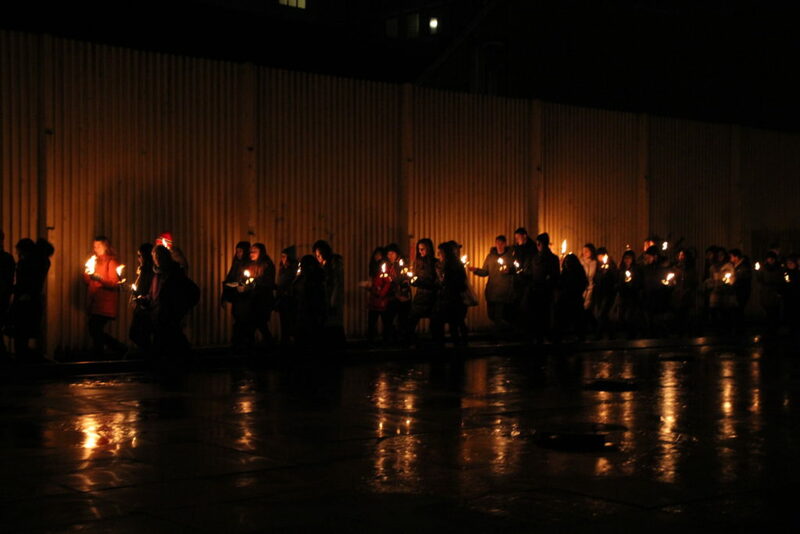 On Friday the 17th of February, The Walk of Peace will be lighting up the city of Trondheim once again. The traditional torchlight procession is an important part of ISFiT and symbolizes the spirit of the festival: our goal is the same, each and every student has our support, and we are all in this together. With the winner of the Student Peace Prize, Hajer Sharief, marching in front, the procession will make its way through the streets of Trondheim and end up at the award ceremony at Olavshallen. The Walk of Peace begins at Studentersamfundet at 5 pm and will reach Olavshallen at approximately 6:30 pm. The procession itself is mainly for the ISFiT participants and volunteers, but it will be a beautiful and extraordinary event that everyone is encouraged to go out and experience. We hope to see you all in the streets of Trondheim on the evening of the 17th of February, showing support for the students fighting tough battles all over the world.